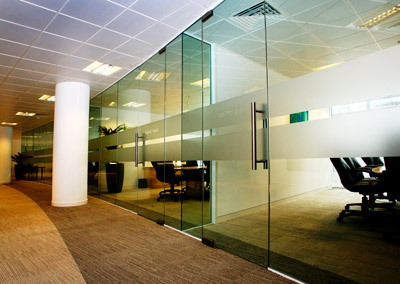 For the perfect partition for the office, choose our single or double glazed glass office partition. We’ve installed glass offices up and down the country, creating light and airy spaces where a solid wall may have had the opposite affect. We’re vastly experienced where glass is concerned – we’ve created curved or straight glass office partitions as well as fitting privacy glass and even smart film – which switches from clear to opaque at the touch of a button. The opaque glass partition is then perfect for projecting onto, thus saving you space and money. There’s no doubt that a glass office is more open and modern than one that uses metal or plasterboard walls, they encourage collaboration but can also offer privacy when needed. The material is easy to clean and strong, even offering an element of sound proofing at up to 45Db. We’ve recently used glass partitions at Stoke Council and ‘The Edge’ in Salford, why not contact OBG to discuss how we can use glass office partitions to create the perfect office space for your needs? Please get in touch with us if you’re after any form of single glazed office partitioning, double glazed office partitioning, or any form of curved glass walls & curved glass partitions. We can also supply curved glass interior doors. 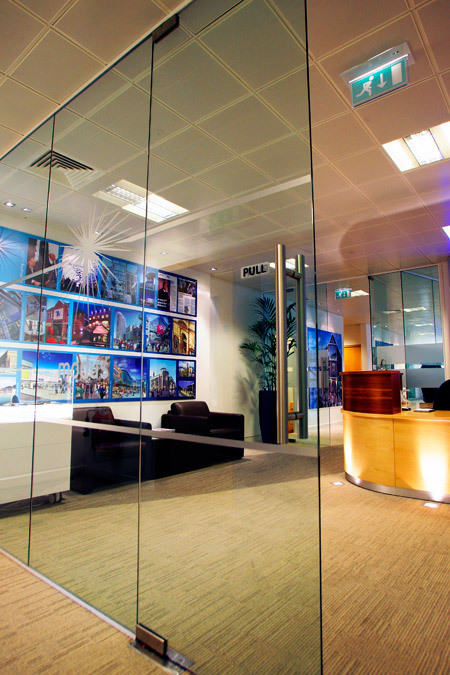 Why choose Glass Office Partitions for your business?